To celebrate Small Business Saturday and Cyber Monday, we’re having a sale on our plastic playing cards! 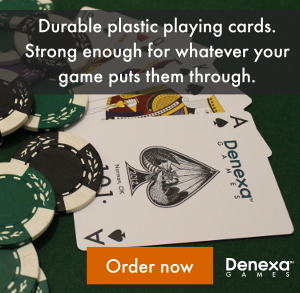 Save $3.49 on a two-deck set of Denexa 100% Plastic Playing Cards now through Monday, November 30. Order today before this deal ends! We’ve just launched our first project on Kickstarter! We want to bring the quality and durability of our cards to those that prefer bridge-size cards, which is narrower than the poker-size cards we offer now. They also feature completely redesigned artwork on the face cards! 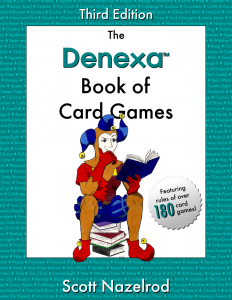 If you like what we do here at Denexa, please take a look at the project page and consider becoming a backer. You’ll get a set of these cards before anyone else, and you’ll be helping us move forward to bigger, more awesome things. If you can’t do that thing, please tell one of your friends or share this post with them to help us get the word out. We really depend on your help to make this happen. Thank you so much! 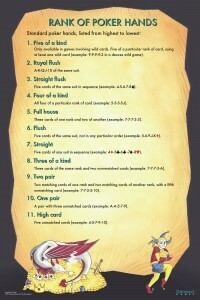 Rank of Poker Hands Poster now available! One of the most frustrating things about poker to new players is learning the hands and the order they rank in. 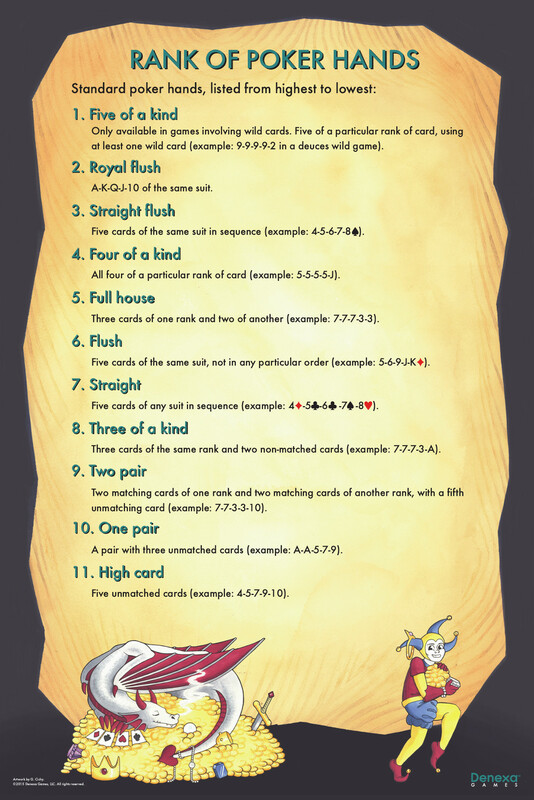 Now, you can help your newer players with our new Rank of Poker Hands Poster! This poster makes an excellent addition to your card room, and is priced at only $5.99. Your players will appreciate it! Do you have an account on Tumblr? We are running a giveaway on our blog over there from now until April 30! 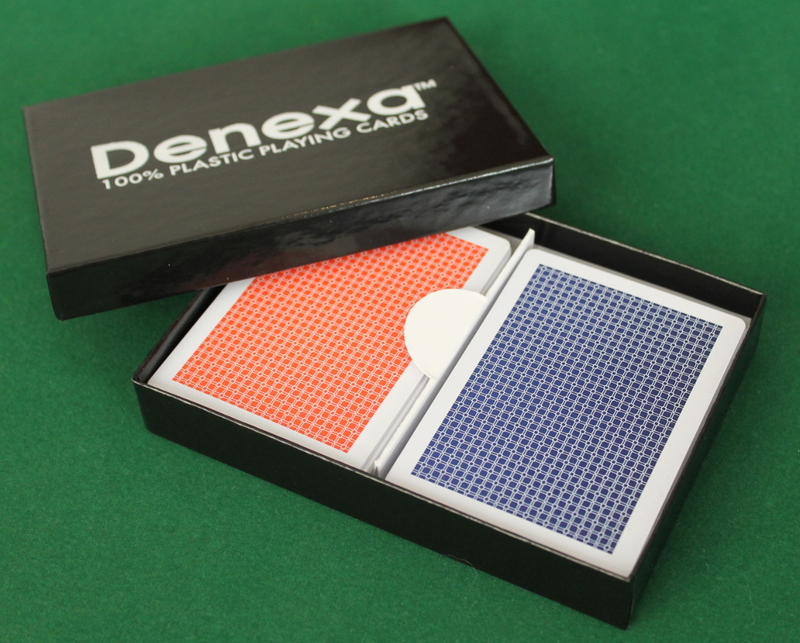 You could win a free set of Denexa 100% Plastic Playing Cards, a set of cut cards, and, if you follow us on Tumblr, one of our Mini Chip Count Boards! All you have to do to enter is reblog this post on your Tumblr account! Good luck! Denexa 100% Plastic Playing Cards are now available on Etsy! Of course, you can always get them on our website too. Plastic cards sliding too much? It can take time for someone who is used to handling paper cards to get used to plastic cards. One of the main problems people have when adjusting to plastic cards is managing the slipperiness of the cards. A specific problem that a lot of people encounter is squaring up the deck in a nice pile on the table. The top card will, seemingly of its own volition, try to slide off the top of the deck. Fortunately, this is an easy problem to counteract. All you have to do is press down on the top card with your index finger as you’re setting the deck on the table. This forces the air out from between the cards, increasing friction between them. The cards will stay in a nice, neat, squared-up pack, with the top card remaining exactly where it should.